The British Jackal High Mobility Transporter Vehicle production started in 2007 to meet an Urgent Operational Requirement for the British Army The contract has since delivered with huge success. 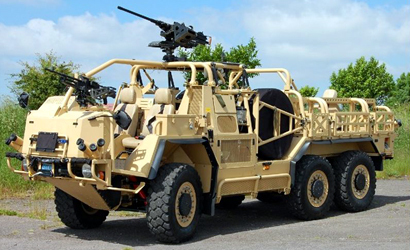 Jackal vehicles are produced by Babcock under an alliance with Supacat, the prime contractor and design authority. Supacat is responsible for design, development, prototyping, integration and programme management, while Babcock takes responsibility for detailed production planning, purchasing and manufacture at its Devonport factory. The vehicles are built by a team of up to 130 Babcock employees working on the Devonport pulse production line, along with a smaller project management team of 25. The pulse production line involves dividing the total manufacturing activity into a series of 12 equally balanced packages or ‘cells’, and the vehicle is physically moved, or ‘pulsed’, from one area assembly to the next on a daily basis. Application of a ‘lean’ philosophy has identified and eliminated any non-value-adding activities, and serves to ensure that the demanding delivery schedules and critical quality and reliability requirements are met. This is coupled with highly effective supply chain management to reduce lead times, ensure quality and reliability, manage obsolescence, and ultimately drive down the cost of construction and ownership. Production runs at a rate of one vehicle a day. In service are three Army variants based on the high mobility transporter – the 4×4 Jackal in three variants (1, 2 and 2A, (the chassis of Jackal 2 is heavier than its predecessor to give additional protection), the 6×6 Coyote and the 6×6 MEP (Military Enhancement Programme) vehicle. The Coyote tactical support vehicle (TSV light) is based on a 6×6 derivative of the Jackal 2 and will support the go-anywhere high-mobility Jackals across the harsh Afghanistan terrain. The extra two wheels will give a heavier vehicle, approaching 10,500kg, which will act in support of the Jackal 2 and allow transportation of supplies and equipment over similar terrain (the payload for supplies and equipment will be 1.5t). The Coyote will carry an extra crew member than the Jackal 2, but will have similar protection systems, armament and propulsion. Coyote and Jackal 2 are part of a £700m Protected Patrol Vehicles package to put highly protected, versatile vehicles on the front line. The MEP was procured as the base vehicle for the Soothsayer programme, which was cancelled in 2009, but 35 vehicles were produced. The first Jackal contract was placed on 28 July 2007, and the first vehicles entered service in November 2007 – vehicles were in theatre in early 2008. Follow-on buys occurred in 2008 to bring the total to more than 200. On 9 April 2008, the contract was signed for more than 100 more Jackals – these were at the Jackal 2 build standard and entered service in August 2009. On 12 May 2010, a contract was signed for around 140 Jackal vehicles, at the Jackal 2A build standard. Approximate contract value of the various buys is £174m for Jackal 1 and £45m for Jackal 2A. More than 70 Coyote vehicles have been built – the Coyote is the light vehicle in the Tactical Support Vehicle family and entered service in August 2009. The Jackal 2 contract and the Coyote contract were awarded together, with the number of vehicles changing during the buy – the combined value of the two contracts is £140m. In post Afghanistan War, The MoD has committed to keeping 400 Jackal and 70 Coyotes in service for reconnaissance, rapid assault, fire support and convoy protection.